Taipei, Taiwan – May, 24, 2016 – Tt eSPORTS, the energetic and powerful challenger reveals the new CHALLENGER EDGE Membrane Gaming Keyboard that packs a whole lot of features at a budget friendly price with a brand new floating keycaps design, delivering stunning colors below each keycaps that provide gamers a more attractive and in-style look while gaming! Additionally, it was created with a splendid black brushed aluminum faceplate and double injection keycaps that makes it cooler and more extraordinary! With its special floating keycaps design on the amazing aluminum faceplate, the keycaps offer a brighter backlight! Furthermore, the splendid black brushed aluminum faceplate also adds a stylish flavor, allowing it to shine and makes it extraordinary! You will surely never get bored looking at it! The CHALLENGER EDGE Membrane Gaming Keyboard comes with 8 stunning RGB colors and 4 lighting effects (Static, Pulse, Pulse Jumping and Spectrum Running) that bring the amazing colors for astounding appearance! You can customize the 8 lighting colors, effect speed on the keyboard itself. Tt eSPORTS engineered a real RGB keyboard which offers better and stronger colors and features that fit all needs! With all these beautiful colors on this membrane keyboard, you can color up your keyboard and power up in your battle! You can choose to lock the Windows Key or lock the entire keyboard when you feel like it! Lock the Windows key whenever you are in an intense game to prevent accidentally pressed! You can also lock the entire keyboard to clean the keyboard; therefore, you can clear your keyboard without commanding unintentionally! The sleek aesthetic and membrane switch were purposely chosen to create a very short travel distance to actuation on each key. 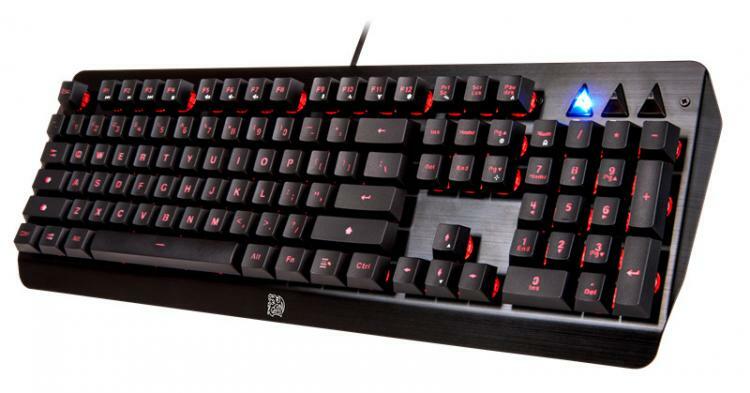 This enables the gaming keyboard to have extremely fast response, giving you the ability to game your best! Moreover, with the N-key rollover, the CHALLENGER EDGE Membrane Gaming Keyboard will allow you to hit combinations of keys at once to make sure your gaming session is as fluid as it can be.